Metallics were the "it" thing in 2009 - but if you ask me, I think they are here to stay for 2010 as well. From invitations to bridesmaid dresses, from pillar candles to vases (don't forget shoes! 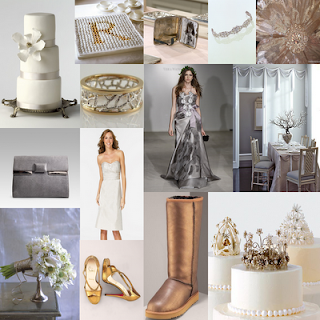 ), metallics bring that chic luster and shine that practically every girl dreams of for her wedding day. My favorite metallic shades are the natural earth tones like brown, gold, silver gun metal and burgundy. Check out this inspirinig mix of photos, highlighting metallics, by Tried and True.